I broke the first rule of drinking Alchemist's Heady Topper Double IPA - I poured it into a glass rather than drinking it straight from the can as the can suggests.. ah well, what a badass I am! Heady Topper is considered one of the best beers in the world according to RateBeer.com and BeerAdvocate.com (#5). Whenever The Alchemist does their weekly limited releases at the local beer stores in Vermont, people travel from all over the United States (and Canada) to line up before the stores open to buy a four-pack or a few flats of the DIPA. If people are willing to travel from all over just for a weekly beer release.. it has to be good! Appearance: Heady Topper pours a very cloudy orange-golden ale which has an appearance that reminds me a bit of a Belgian witbier, perfectly unfiltered. Good amount of carbonation and it pours a thick snow white head that gradually goes down leaving a finger's worth of foam in the glass. Sorry folks - I drank this mostly from the glass (except from the remnants in the can). Aroma: My goodness! There's an incredibly rich hop presence here. Rich notes of pine, pepper, tropical citrus notes (grapefruit with a hint of pineapple). There's an insane amount of hops in here.. something I haven't seen in an IPA for a while. Somewhat acidic and oddly spicy. 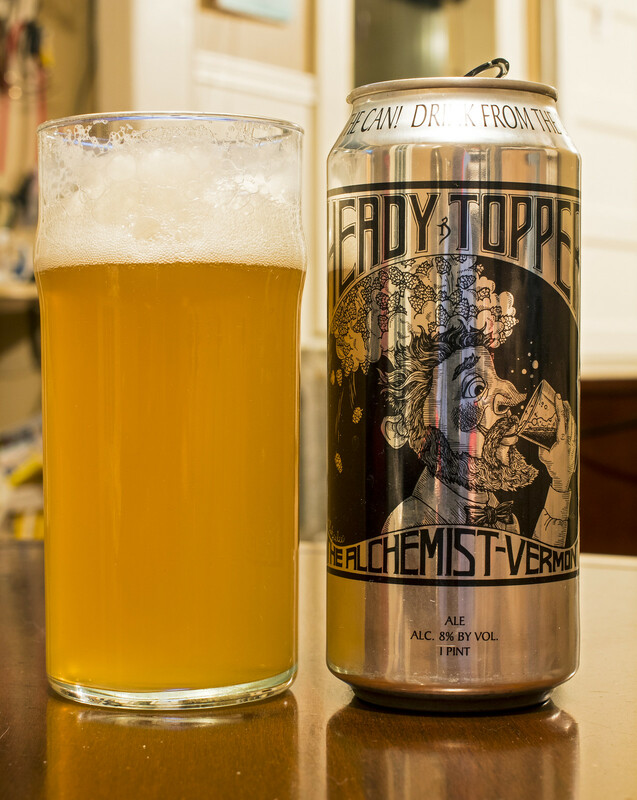 Taste: For those who haven't tried Heady Topper before, this double IPA tops out at 120 IBU.. now thaaaat's bitter! It is frankly way too bitter for my tastes but hey.. when in Vermont! I'm tasting a lot of pine, moderate amount of alfalfa, a hint of rosemary and a nice presence of pineapple and grapefruit for tropical vibes. I've sampled this cold and room temperature and when it's cold, I find it's very heavy on the stomach and burns the esophagus almost immediately. At room temperature, it's easier for me to handle because I actually had to drain pour one can of Heady Topper because it made me gag to the point that I actually barfed.. that's not good!